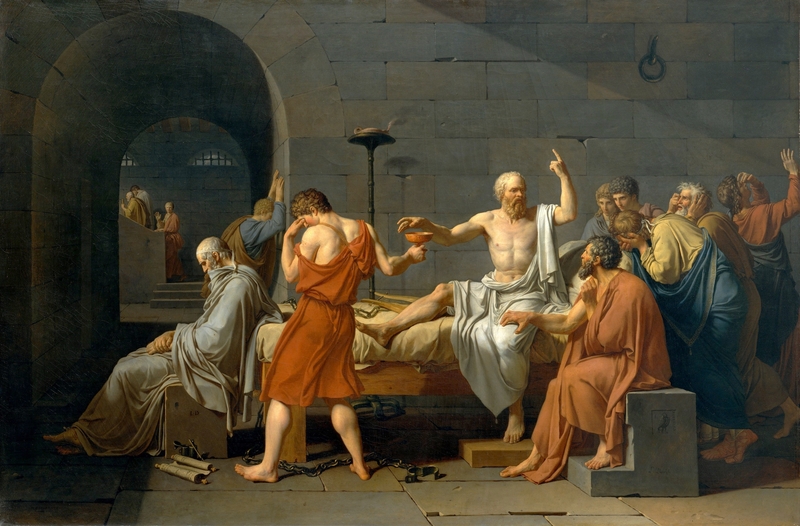 The Death of Socrates, Jacques-Louis David (1787). You drink a glass of ordinary tap water. How many water molecules in this glass were in the blood of Socrates when he died? The standard way of calculating it is to treat it as a Fermi type problem where we need to try to make reasonable estimates to reach at least an approximate answer. To start out: Blood contains about 80% water and a human adult has about 5 litres of blood, giving 4l water. The next question is how much water has this blood been mixed into? Wikipedia tells us that there is about 1.4 × 1021 kg of water on the earth which means the the Socratic water is a mere 1 part in 3.5 × 1020, which, to put it mildly, is not a lot. But, why this question is so surprising to most people is that it’s really hard to get your head around the fact that there are far many more molecules of water in one glass than there are glassfuls of water in the world’s oceans. Since one glass contains about 2 dl (say 1.8 to make it easy), and the molar mass of water is ≈18 g/mol this makes the glass contain 10 moles of water. But one mole is a fantastically large number of molecules, it is in fact Avogadro’s number of molecules. This number, named after the Italian scientist Amedeo Avogadro, is, with scientific rigour, approximately 6.022140857×1023. So our glass contains ca 6×1024 molecules of H2O!1 Dividing this number with the proportion of Socratean water gives us around 20000 water molecules2 in each glass of water that came from Socrates’s dying blood. Remember then, that this is certainly an over-estimation. Not all water on earth will have had time to circulate to mix with Socrates’s blood. The water in the great inland ice-masses of Antarctica has been frozen for tens of thousands of years. The water in the deep oceans mix on a time-scale of a few thousand years, so the mixing during the 2400 years since the great philosopher’s death is certainly not complete. All this would increase the number of Socratic molecules in our glass. But regardless if the number increased to a hundred thousand or a few million, it is still an absolutely minuscule amount. However, compared to the concentrations in homeopathic preparation the Socratean blood is a very concentrated solution: it is diluted a mere 1021 times. Many homeopathic treatments are regularly sold in dilutions of 1060 (called 30C), and sometimes up to absurd values like 200C (diluted 10400 times). Not even all the water on all the planets, moons and in all the comets in the solar system would suffice to dilute even a fingernail of substance this much; nay, not even all the water in the universe would be nearly enough. However, as pedagogical and logical the above solution (see what I did there) might be, tomorrow and the day after we will look at two reasons as to why it is completely and utterly wrong! Including about 1.2×1021 molecules of semiheavy water – DHO – and 2.4×1017 molecules of D2O, heavy water; 6×1016 each of H3O+ and OH–; plus a very large number of different salt ions such as sodium, potassium, chloride, etc.